The other day, driving into NYC, I passed a white-looking Volvo with such an unusual color, I had to take off my yellow-tinted sunglasses. It turned out to be a buttery yellow, and if it's not the first time I've seen it, it was definitely the first time I'd noticed it. What a gorgeous color, so subtle and yet so unusual, it turns heads, but doesn't stand out. 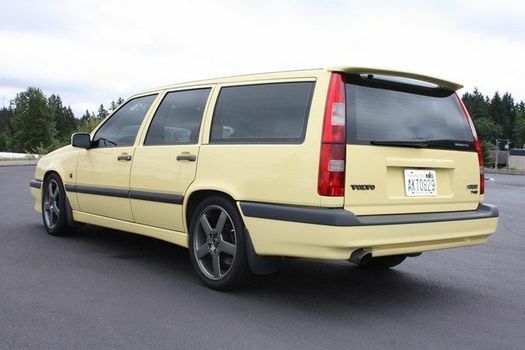 Which would make it the perfect color, you'd think, for a sleeper hotrod wagon like the 850 T-5R, which brought legitimate performance to Volvo's brickish brand in the mid-90s. And yet, it seems that Creme Yellow was only an option on the T-5R for one year--1995--and only buttah 185 T-5R's were sold, the fast majority sedans. Thus the Creme Yellow wagon west of Seattle that came up on eBay last week with an automatic and 230,000 well-maintained miles, and sold for a surprising $9,2001, was described as a "grail car." 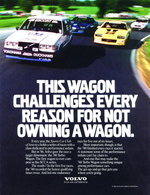 Among 90s Volvo wagon racing aficionados. Of whom 90% probably reside within one tank of gas of this supposed unicorn. Ride on, hot buttered Volvo, may you be filled with artisanal toast for another 20 years! 1 The listing has been deleted, so condition remains a mystery, but a Creme Yellow 1995 T-5R sedan lingered on NYC's Craigslist and VWVortex for several weeks at $3,100 OBO.